Bad Hofgastein: Large, cosy apartment block "Alexander". In the resort, in a central, quiet, sunny position. In the house: sauna, lift, storage room for skis, central heating system, washing machine, tumble dryer (extra). Motor access to the grounds. Stepped path (7 steps) to the house. Parking at the house. Grocery, supermarket 500 m, restaurant 100 m, outdoor swimming pool 300 m, thermal baths "Alpentherme Gastein" 300 m, bathing lake 3 km. Golf course 5 km, skisport facilities 1 km, ski bus stop 150 m, ski school 1 km, cross country ski track 50 m. Well-known ski regions can easily be reached: Bad Gastein, Bad Hofgastein. Hiking paths: Hohe Tauern. Please note: ski bus (free of charge). There are more similar properties for rent in this same residence. All houses/apartments are individually designed/furnished. 2-room apartment 35 m2 on 4th floor. Practical furnishings: living/dining room with 1 wall-trunk bed (80 cm, length 190 cm), dining table and satellite TV (flat screen), hi-fi system. Exit to the balcony. 1 small room, window onto the living room with 2 beds. 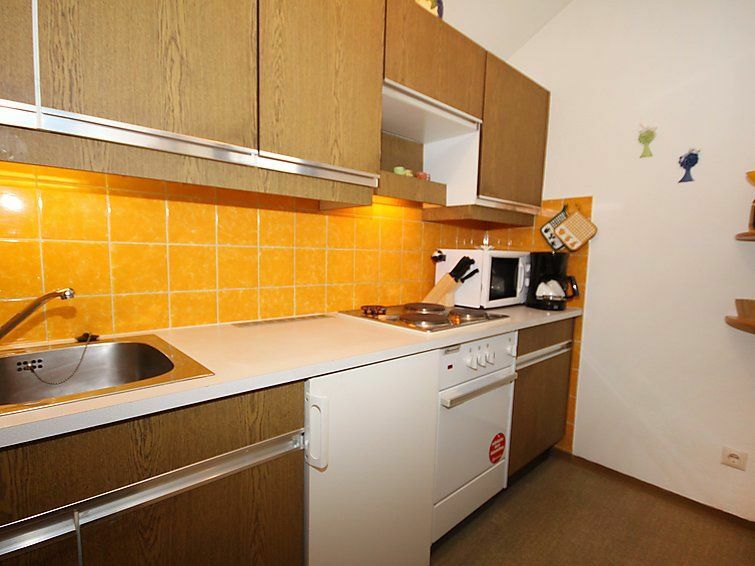 Kitchen (4 hot plates, oven, microwave, electric coffee machine). Bath/WC. Small balcony 4 m2. Balcony furniture. View of the mountains. Facilities: hair dryer. Reserved parking. Please note: non-smokers only.